Dongmin Jin is Director of the the Information & Knowledge Department at the Korea Polar Research Institute (KOPRI). In this interview, done when he was Director of the Department of Strategy and Policy at KOPRI, he discusses KOPRI’s new icebreaker, the Aaron, plans for a new Korean research station in Antarctica, and research priorities, contributions, and collaborations in the coming years. Could you tell us what is the annual budget of the Korea Polar Research Institute? Approximately US $50 million per year. And what proportion of that is spent on Arctic research and on Antarctic research? Most of the funds are dedicated to Antarctic research. We have a relatively short history in Arctic research, but we are looking to expand this area of activity in the future. For the next four or five years, however, our biggest project is to set up new station in Antarctica. Before we get on to that, can you tell us if you have any research infrastructure in the Arctic? Yes, we have Dasan research Station in Ny-Ålesund, Svalbard, which was set up in 2002. Every summer season we send scientists from our institute, Korean universities, and other research institutions. A total of about 70 or 80 Korean scientists visit the station to carry out research every year. And could you tell me a bit about Korea’s new research ice breaker, the Araon? “Ara” means sea in old Korean, and “on” means all, or “whole”. So Araon means something like "on all the seas" or "on all the oceans". So when faced with any extreme conditions, we hope that the ship remains "on" the sea and not "in" the sea! The total tonnage is 7,489, and it can carry up to 85 people, including 25 crew members. Was the Araon built for logistics or science? It was designed for both. Scientists were involved from the start of the design process, so it is very well-equipped for science, with all the latest high-tech equipment, as well as dry and wet laboratories. And although it is not a huge vessel, it carries helicopters and is also very well-equipped for its logistical role. She sailed in Antarctica for about 40 days last season. After a port call in Christchurch, New Zealand, she visited Cape Burks at the edge of Hull Bay on Marie Byrd Island, and Terra Nova Bay in the Ross Sea region. 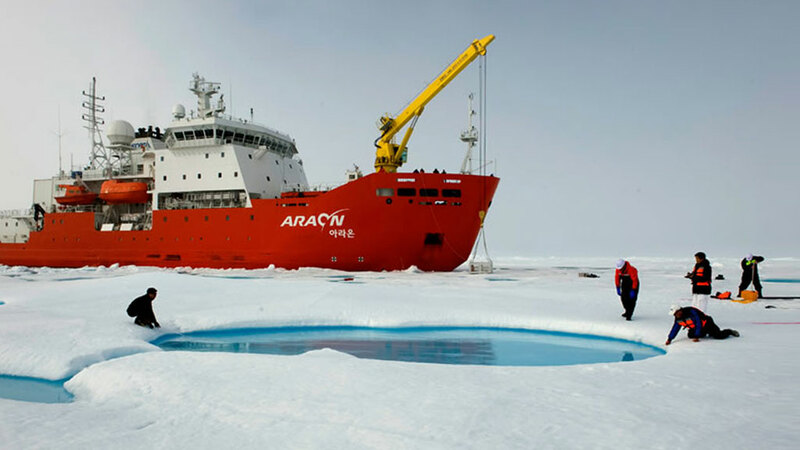 Since this was the Araon’s maiden voyage, the focus was less on science than on sea ice tests, but the scientists onboard did survey the two areas I mentioned previously as candidate sites for the new Antarctic station we are planning. In the summer, the Araon then sailed to the Arctic across the Chukchi and Bering Seas. Do you plan to sail to both the Arctic and Antarctic every year? Yes, that’s our plan. But cruises are very expensive, so it will always depend on budget availability. What sort of international collaborations are you planning for the Araon? The longer-term details of this are still being worked out. But for example, for our Arctic cruise, we had foreign scientists from the UK, and also some Chinese and Japanese scientists working onboard. Certainly, the longer-term plan is for the vessel to remain open to foreign scientists. You mentioned the new station you are planning to build in Antarctica. Could you tell us more about it, starting with its chosen location? As far as location goes, as mentioned, we considered both Cape Burks at the edge of Hull Bay on Marie Byrd Island, and Terra Nova Bay in the Ross Sea region. However, our surveys have shown that Cape Burks experiences severe sea ice conditions, which would make it difficult for the ship to get close to the station, and would require us to depend heavily on the helicopter for logistics, which is obviously very expensive. On the other hand, at Terra Nova Bay, the ship will be able to approach the coastline more easily, and we will be able to collaborate with other national programs. New Zealand’s Scott Base is not very far, and Italy’s Mario Zucchelli summer station is 12 km away from the area we are looking at. Will your station operate year-round? That’s our hope and plan. Do you think Cape Burks might have been a more interesting location because there are no other stations in the area? There are advantages and disadvantages to both Cape Burks and Terra Nova Bay, of course, but as I’ve explained, Cape Burks is very difficult and expensive logistically. All the necessary information was given to the government and following a whole series of meetings with experts at the government level, the decision to build the station at Terra Nova Bat was made on grounds of safety, logistics, and international collaboration. What’s more, building a station at Terra Nova Bay means that every year the Araon will sail along the West Antarctic coast from the Ross Sea to our King Sejong Station on King Georges Island in the Antarctic Peninsula region. This means that even without a station at Cape Burks, we still have the opportunity to survey in the western Antarctic areas where Cape Burks is located. When do you plan to start construction on the new station, and how long will it take? During the coming Austral summer season, 2010-11, we will do another in-depth survey of the area, including the sea and coastline. Then at the next Antarctic Treaty Consultative Meeting, we will submit these reports for discussion. If all goes according to plan, we then hope to carry out the construction work during the 2012-13 and 2013-14 summer seasons. Have you already worked on the station design? What sort of building are you thinking of? We haven’t started working on the design, but we are considering new concepts such as Belgium’s Princess Elisabeth Station. We think it’s a very good model, and are looking at different green technologies available on the world market. This includes green energy like wind and solar, but also energy saving technology, like for Princess Elisabeth. How many people will the station be able to accommodate? We are planning for about 13 or 14 people for over-wintering, and between 50 and 60 people in the summer. What is the “life expectancy” of new station, and also of the Araon? In the case of the new station, about 25 years, and in the case of the ship about 25 years, but if they are very well maintained, this can be longer. About US $ 90 million for the new station, and US $ 90 million for the ship. These costs are mostly covered by funding that comes on top of our annual budget. What would you say are the major strengths in Korean polar research, and which fields of research will you prioritize at the new station? KOPRI developed from the Korean Ocean Research Institute, I think I can say that we have world-class scientists in the field of ocean science, including physical oceanographers, marine biologists, and marine geologists working in Korea. So I think we will be able to contribute research with respect to these key areas focusing on climate change and its effects on Antarctic ecology in general. So you would you say that the bulk of Korean polar research is marine-based? That’s partially correct, but we also have interests in terrestrial, glaciological, and atmospheric research. We have some projects going on in these fields. Do you already have a glaciological Institute in Korea? Not a separate research institute, but KOPRI has a glaciological research group. For example, we are one of the participants in the NEEM ice coring program in Greenland. What are your ongoing plans for your existing King Sejong station on King George Island? Recently, SCAR has emphasized the importance of collaboration between the ten or so research stations on King George Island, so we would like to contribute to this priority. Up to now we have been collaborating with Germany’s Alfred Wegener Institute (AWI), but we are now also talking with Chile and China about potential collaborations in the field of terrestrial biology, for example. We are also in discussions with the Chileans about organizing some kind of annual symposium between the stations on King George Island. Dongmin Jin is Director of the Information and Knowledge Department at the Korea Polar Research Institute (KOPRI). From 2006-2012 as Director of the Policy Development Department of KOPRI, he lead the drafting the National Antarctic Activities Basic Plan 2012-2016 and was involved in making major research plans for KOPRI. He was a Korean delegate for the Antarctic Treaty Consultative Meeting (ATCM) and Council of Managers of National Antarctic Program (COMNAP) during his time in this position. He was also the executive director of the 2011 Arctic Science Summit Week (ASSW) Seoul Meeting. He is a Korean representative for the Standing Committee of Antarctic Data Management (SCADM)/SCAR and social science working group of International Arctic Science Committee (IASC).